Day 2 Lunch under the only shade on the trail! Day 2 was another hot day with lots of climbing and big rocks to overcome. 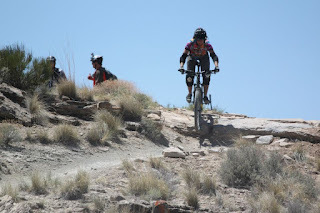 I did pretty well but was well behind the rest of the pack because of my fear of spiny ridges (I felt like I was going to fall all the way down the mountain when biking on a skinny strip of dirt) and my lack of endurance. We did part of the Western Rim Trail which was pretty amazing- seeing the giant canyons and getting to bike along there! There was no shade for most of the trail though so we got a lot of sun exposure. Lunch was under the biggest rock out there. We got to camp okay but I was feeling pretty awful by the time we settled down for the night (in camping time that is 4 pm!). My stomach felt queasy (it felt like it was overfull with water) and I ended up lying down in the tent and around 7:30 pm, I hurled all the contents of that day, pretty much filling up a large ziploc bag with watery vomit. It was oh so pleasant. But I did feel better after throwing up. I'm not sure if it was a bad tomato or the turkey in my lunch sandwich or the heat or something else but my stomach just wasn't behaving. I felt pretty tired after this and ended up taking an abbreviated ride with one of the guides (John) on Day 3. The rest of the crew did the long, hard tough ride (they told me Day 3 was the hardest!). I was okay missing it though. I ended up doing part of the Kokeppeli trail (Rustler's loop and part of Mary's trails) and that was enough for me! The trails included great views of the Colorado river. Day 4 was totally different from the first 3 days, we were on the 18 Road trails which is really close to town so we saw more people out on the trails. We did Joe's ridge, Prime Cut, and Kessel Run (get the Star Wars reference? I didn't!). Kessel was really fun, you didn't even need to break and there were some rocks you could huck off of, of course, it was impossible to get a picture taken because everyone was enjoying just going really fast. Prime Cut was the long uphill after doing Kessel Run and then Joe's Ridge was the challenging spiny ridge line climb and downhill. In order to not let the fear get to me, I focused on just the strip in front of my bike and didn't dare look to the sides because I knew I would end up falling off the mountain! I felt really proud of myself for doing Joe's Ridge and figured that was it for my "challenging" rides but Simon said I was going to do Zippity Do Da (a longer, harder version of Joe's Ridge). It was getting really windy so we ended up doing other trails and saved Zippity for the last day. Day 5: Zippity and someone getting hurt. I took this from the Zippity ridgeline above, not knowing that Pete had fallen and the biker going to that first peak is where it happened! On the morning of day 5, all 3 guides geared up to go riding with us. We were all looking forward to doing Zippity and the first 2/3 of the trail was pretty exciting and scary when we found out that one of friends (Pete) got hurt after landing badly on a hill. He was going so fast that when he crested the hill, he hit a loose dirt patch and his bike started doing cartwheels. We saw him on the side of the hill in pain and hurt badly. An ambulance took him off the trails and he ended up having 3 broken ribs, a collapsed lung and a broken wrist. It was not a great way to end our trip but that is how it ended. Pete is mending and there was no permanent damage, just a little disappointment and regret for getting hurt. In the end, I think I got about 70 miles of riding in 5 days, it was pretty awesome. I like Western Spirit mountain biking trips. This was my third one in 5 years and they do a consistently great job. 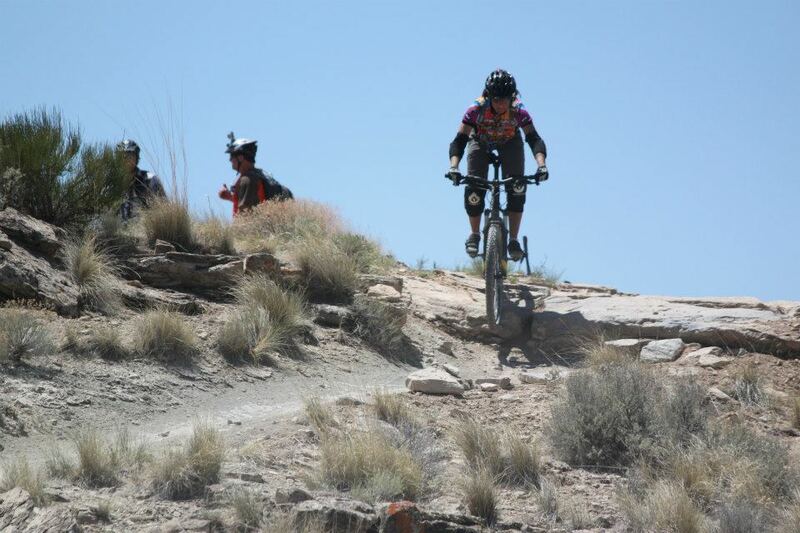 The guides are cool, they know how to mountain bike (they are the true BAMFs) and they are so unassuming about it all! I hope someday I can ride like they do. The past week has been too busy to allow blogging but I have been working out. Friday: hilly single track near my apartment, affectionately known trail "Sludge". Even in the easy direction, there are some good climbs. It was about 4 miles total. Saturday: trail run at Umstead, Sycamore trail 7.5 miles, it took me a long time! By 5 miles I was spent but I soldiered on to finish. Sunday: a casual hike on the Company Mill trail with my parents, we did 4 miles. Monday (today): bike ride at Umstead park on the bridle trails, a total of 16 miles. I'm aiming to ramp up the intensity of my workouts in June and go back to Forged Fitness. I need the discipline of going to the gym at 6 am and seeing people to adhere to intense workouts. My back feels normal but I still have some joint pain, I'm no longer sure if the physical therapist can do anything for me, so I'm going to see the chiropractor. If that doesn't work, it's off to see an orthopedist.